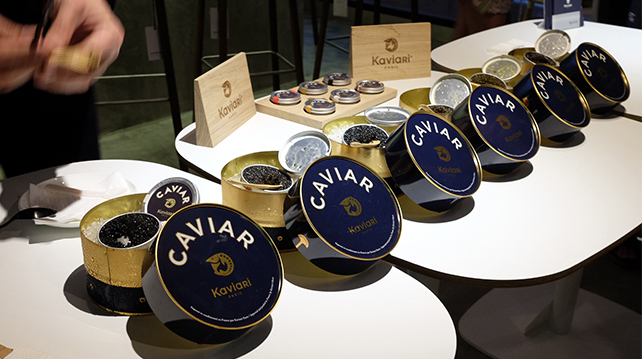 Poseidon Caviar & Seafood Bar opened their doors again to another rather decadent treat: sampling a selection of quality French caviar from Kaviari. 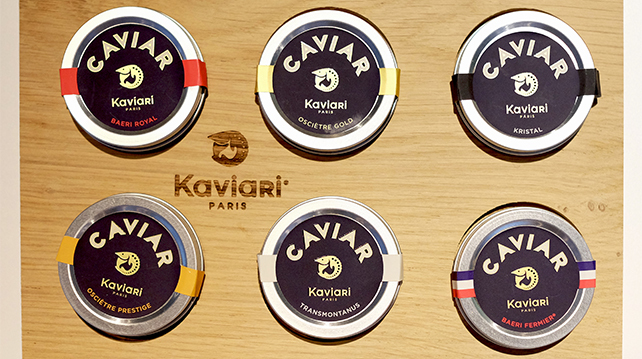 Kaviari brand ambassador Remi Montariol explains how to appreciate caviar. 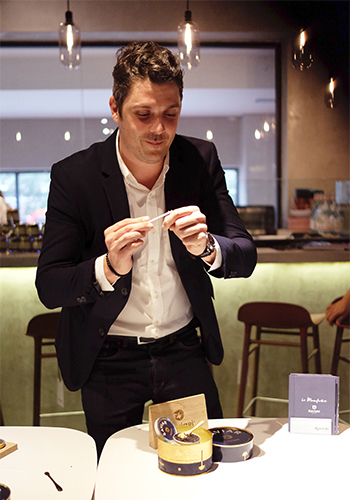 Led by brand ambassador Remi Montariol, the session featured six caviars from their range, including the extremely luxe Beluga. The way to appreciate caviar, according to Montariol, is first by sight – the colour of the eggs (or grains, as they’re called) goes from black, blueish grey, and even golden, depending on the species of sturgeon fish the eggs are harvested from. Something like Beluga is an enchanting elephant grey, with an ‘eye’ marking which is typical only from this species. Caviar from Beluga has an 'eye' in the middle of the egg. Temperature is key to storage as well as presentation, as the eggs are fragile and sensitive to even the slightest warmth. 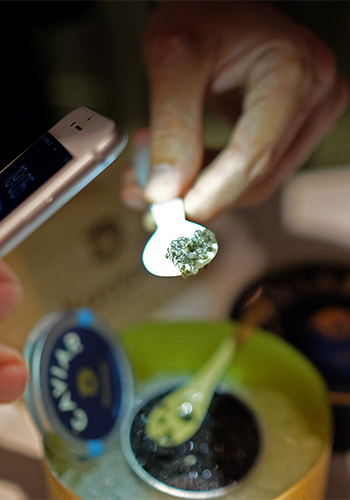 Tins are stored between 0-4 degrees Celsius, served on a bed of crushed ice, and is transferred from tin to the back of the hand by spoon (made of either mother of pearl or wood, but never metal) where it can stay only between five and 10 seconds or it gets affected by the body temperature. Temperature is key for serving caviar, 0-4 degrees Celsius is optimum. In the mouth, the caviar is not chewed but instead rolled between the tongue and the roof of the mouth. The eggs will pop, and depending on their size might be more or less yielding, meaning the pop might be more noticeable. Expect a flavour profile that varies from briny, buttery, smoky, and nutty, depending on the species. Montariol eased us into the world of Kaviari with Transmontanus, a good introductory caviar from White sturgeon of Italy. The flavour is salty and pronounced, but not too complex or intimidating for a novice. 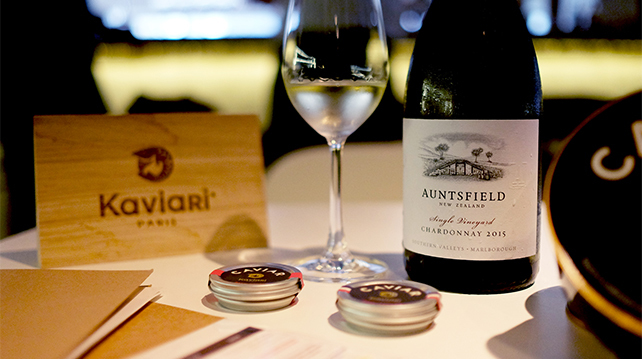 On the higher end of Kaviari’s selection is Kristal – from Amour sturgeon of China – which is a favourite choice for top chefs with its almond finish; and the famous Beluga Imperial, from Beluga sturgeon, which has a sumptuously buttery flavour and long aftertaste. The caviar was served with glasses of chilled New Zealand Chardonnay, but if you want to enjoy it the Russian way have it with a shot of straight vodka (fur hats optional).